"To live is to hunt; to hunt is to live!" Profile: As the living incarnation of the six distinct and often feuding Seacon personalities, Piranacon might lead one to believe that his six-part mind must be confused and tormented. Quite the opposite is true. The bottom line on all Seacons is that they love what they do, and what they do best is hunt for prey. Piranacon is the truest expression of this lethal talent. From the moment the Seacons combine to form him, he is hunting for prey. When he finds and destroys one hapless victim, he immediately starts looking for another. He will continue this course of behavior until he runs out of fuel (which he inevitably will do since he never pauses to re-energize) or until he is stopped (which considering his awesome power, rarely happens). 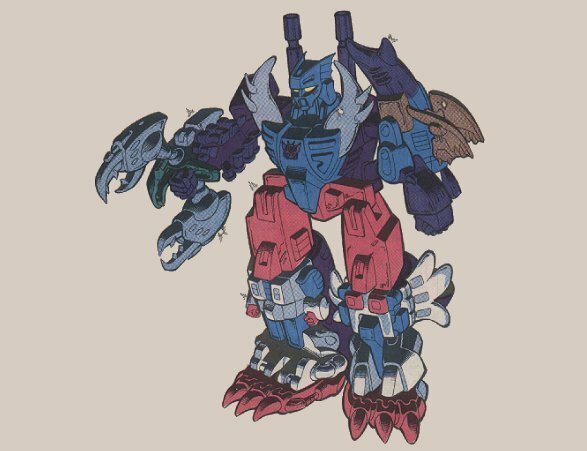 Usually, Seacon leader Snaptrap sets an internal timer in advance of combining with the other Seacons to insure that Piranacon will automatically disassemble into his component Seacons at some future time. Piranacon is so single-minded about his task that he will brush aside - if necessary, knock aside - any Decepticon who tries to talk to him about anything else. More than a few of his comrades have had a few screws jarred loose (and worse) by merely asking Piranacon if he would like his joints lubed, or some equally innocent question. "I wish I had a thousand more like him," Decepticon Commander Megatron says with a smile. Abilities: Piranacon's strength is immense. He can hold up to 4,000,000 tons, making him ideal for lifting freighters and various warships from the sea. He is fully operational up to a depth of 30,000 feet below sea level. He only walks at a maximum speed of 15 mph on land and 10 mph undersea, but since he is virtually impervious to weapons-fire, his need for speed in order to evade enemy attack is negligible. He wields a jawbreaker cannon (which is actually the weapons-base mode of the Seacon Overbite), which shoots powerful metal-eating, salt-based corrosives. Weaknesses: Piranacon has no known physical weaknesses. His one track mind often prevents him from accepting the advice and help of others, usually to his detriment. He jeopardizes his well-being by not attending to his own basic needs, such as refueling and removing rust spots.